Protecting Your Landscape in the Winter | Done Right Landscape and Construction Company Inc.
With the freezing cold temperatures, snow storms, and other inclement weather that comes along with wintertime, so does a plethora of worries regarding your landscape. Although your lawn might be covered in snow for the foreseeable future, that doesn’t mean you can sit back and forget about it until springtime. In fact, protecting it during the winter is crucial to a flourishing landscape when the time comes. 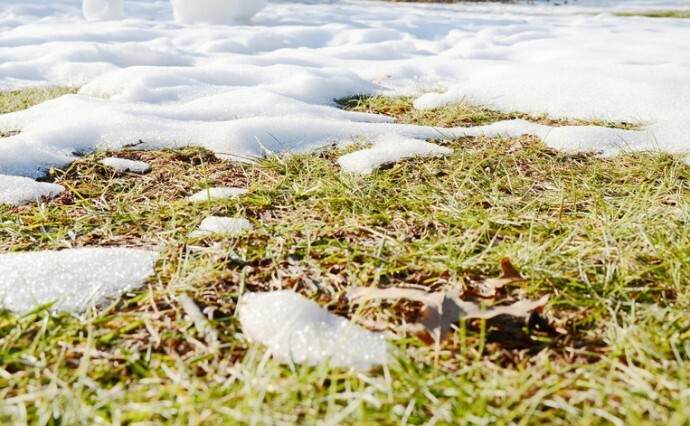 Check out these tips to ensure your landscape is not damaged this winter. Reducing foot traffic as much as possible in the winter is highly recommended. Those cold mornings and nights usually result in frost on your grass, and walking over it can cause damage to the grass blades. Additionally, if snow has accumulated, walking on it compacts the snow which creates pressure on your lawn. These footprints can linger, causing brown spots or even killing the grass completely. To avoid having to reseed in the spring, stay off your grass! Having your driveway plowed by someone who doesn’t necessarily know where your driveway starts and ends, can be a recipe for disaster for your landscape. Marking your driveway with stakes, flags, or any type of physical boundary will ensure that plows are staying far away from your precious landscape. If you need to use salt or ice melt to make your driveway less slippery, be mindful of the effects it can have on your lawn. Be careful of products with fertilizer, as your dormant lawn cannot absorb it. Instead of using road salts or ice melts, which can alter the PH levels of your soil and damage your lawn, try choosing a product that has calcium magnesium acetate instead. Not only is it better for your lawn, but the environment too! To learn more about best practices for your lawn and landscape in the winter time, contact the experts at Done Right Landscape! If you have questions, fill out a contact form or give us a call at 781-858-8000!